ExtJS is now in its 4th version, and this latest version includes some very nice drawing and charting classes. Under the hood, they determine available browser technology and make use of it, allowing you to write cross-browser charting and drawing applications. To this day, it astounds me that Microsoft refused to include support for SVG in their earlier browsers and instead tried to embrace their own proprietary technology (which is actually nothing unusual for them.) And I suppose Adobe might have seen SVG as a threat to Flash, which they also acquired when they bought Macromedia, and perhaps that’s why they shelved the SVG plugin. But SVG was—and still is—an excellent technology dating back to 2001. Either way, SVG support in IE was limited, and if I created a web site that used it, my users would have to install a plugin that might not be available in the future. And it was either that or write two separate versions of my code, one for IE, and one for, well, almost everything else. While there were other options available, such as using Flash or Silverlight, these didn’t set well with me because I needed to give my users the ability to draw anywhere on a page. I did find a really odd library that would plot lines using tiny, single-pixel-sized divs that were colored. But a single line could use hundreds of divs, and a full-color 500 by 500 pixel drawing could end up using as many as a quarter million div elements! No thank you. I like my app to use less than eight Gig of RAM, thank you very much. 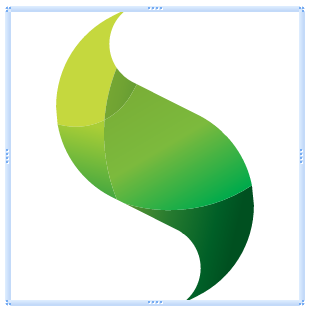 In April of this year, Sencha released the 4th version of ExtJS. It has quite a few improvements, but the set I want to focus on in this article is the drawing tools. (If there’s interest from DaniWeb readers, I’ll review other portions of ExtJS in future articles.) Sencha has worked hard to create a powerful, cross-browser drawing library that detects the browser and uses the best drawing tools available to the browser. You, the programmer, just use the Sencha drawing library, and it does the rest. Although this is the 4th version of ExtJS, it’s really the first version of the drawing tools, so there are still some improvements that need to be made, but it’s a great start. Let’s take a look at it. In the actual example, however, you can resize it. Notice that it scales nicely. That’s because it’s a vector drawing. I cut off the code in the middle of the initialization object, but so far we have initialization members that set the height, width, and resizing information. Then we have a member that tells where to render the object when it draws, in this case, the body element of the document. 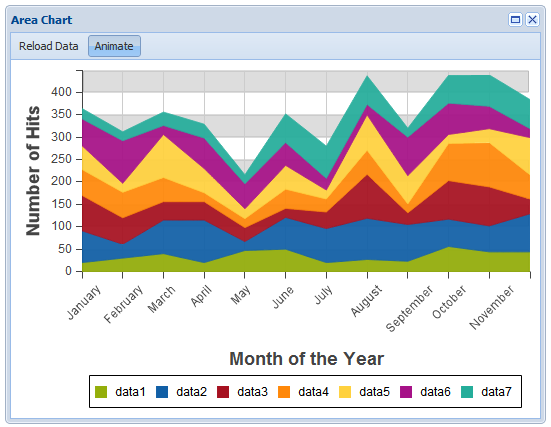 Click the Reload Data button above the chart, and notice how the data is animated as it changes. For these examples, there’s a function that generates random data. In this case, the data is a two-dimensional array, and the data points are stacked. The next member here is store. That’s a member used in many of the controls in ExtJS; that’s where you provide the data. ExtJS includes many different types of store objects, and these objects push data into the controls. The different types of store objects used different means for getting the data, including Ajax or just hard coded as arrays. That makes for a handy way for accessing data from very different sources without having to worry about the details. Whenever I review ExtJS, two things happen in the comments that follow: First, some people who have a competing product show up to trash ExtJS, saying every possible bad thing they can about it. Second, people gripe about the licensing issues (and some even sending me private emails about it as if I’m somehow connected to the company, which I’m not—I’m an independent consultant who writes for DaniWeb as a freelancer). All in all, this is a fantastic product. I love the charting and drawing tools, and with this product now available, I may well be able to finally get back to the collaboration tool I had started developing several years ago. Thanks for the review. On the topic of Pricing, you can visit http://www.sencha.com/store/extjs/ then click on "Purchase Licenses & Support Separately" and the 329 price comes up. No change in price was made for single developers, but we encourage everyone to get support when purchasing a license. Here's a JS framework called Raphael.js that can be used instead of Ext JS and is free to use.